Large study shows the association is more pronounced with increasing age. Obesity increases the risk of rapid loss of kidney function, particularly among older patients, according to a new study. “Our results lend support to earlier findings of associations between obesity and increased prevalence of metabolic syndrome and chronic kidney disease,” researchers reported online ahead of print in The Lancet Diabetes & Endocrinology. A team led by Csaba P. Kovesdy, MD, of the Veterans Affairs Medical Center in Memphis, studied a national cohort of 3,376,187 veterans (mean age 60 years) with an estimated glomerular filtration rate (eGFR) of at least 60 mL/min/1.73 m2. 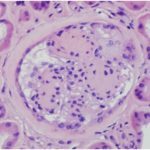 Of these, 274,764 (8.1%) experienced a rapid decline in kidney function, defined as a decrease in eGFR greater than 5 mL/min/1.73 m2 per year. The investigators observed a generally consisted U-shaped association between body mass index (BMI) and rapid loss of kidney function in patients older than 40 years that was more pronounced with increasing age. BMI did not appear to predict renal function impairment in patients younger than 40. Patients with a BMI of at least 25 but less than 30 kg/m2 had the lowest risk of rapid decline in kidney function. Over a median follow-up of 6.8 years, 672,341 patients died. BMIs of less than 25 kg/m2 and greater 35 kg/m2 were associated with higher mortality rates than the other BMIs, the researchers reported. “Considering the effects of obesity on both kidney function and mortality, we propose that weight reduction in very obese individuals should be started at an early age, and maintained long term (potentially for several decades) to reap the most benefits,” they stated. Strong evidence suggests that obesity exerts negative effects via various mechanisms, either directly (e.g., increased renal sinus fat) or indirectly (e.g., obesity-related hypertension or diabetes), Dr. Kovesdy’s group noted. The glomerular hyperfiltration characteristic of higher BMI typically starts at a young age, and in stages of prehypertension or prediabetes, the authors explained. Substantial physiologic and structural changes, however, might only occur after long exposure, followed by irreversible pathologic changes after even longer time. “It is thus possible that progressive loss of kidney function becomes most obvious in individuals who were exposed to the effects of obesity for the longest time, which could explain the accentuation of this association with older age in our study,” they wrote. Another potential explanation for the observed findings is an accentuation of the deleterious renal effects of obesity by the structural changes occurring in aging kidneys. For the study, researchers calculated eGFR using the Chronic Kidney Disease Epidemiology Collaboration (CKD-EPI) equation. The study cohort had a mean eGFR of 83.8 mL/min/1.73 m2. Regarding study limitations, the authors noted that most subjects were male U.S. veterans and had a high prevalence of comorbidities, which reduces the generalizability of the findings to women, the general population, or individuals from other parts of the world. In addition, despite adjusting for multiple potential confounders, they could not rule out the effect of unmeasured confounders.